Beautiful 2 bedroomed quad villa, fully equipped, providing plenty of comfortable seating in the living room, with satellite TV (English Channels only), DVD player & radio. The large patio area to the front, with outdoor table & chairs, is great for relaxing in the evenings. Just 2 minutes brings you to the beautiful communal pool,which is for use exclusively for residents, with ample area for sunbathing. For sun lovers, the villa has its own large secluded solarium with sun loungers and master bedroom balcony. Both bedrooms & living area have air conditioning units(no extra charge) and ceiling fans. Off road parking is also provided. 5 min walk brings you to the 'Strip' where there are a wide variety of shops, restaurants and bars with something to suit every taste. 2 large supermarket are within walking distance, supplying a wide variety of excellent fresh produce for self catering. The local bus will bring you to Torrevieja, Alicante or Cartenga. the new LaZenia Boulevard shopping centre is just 5 minutes drive. There are 3 beaches within easy access, all have life guards on duty in the summer months. The area caters for English,Spanish, French, Russian , Swedish and Norwegian. The villa has a spacious living room area and the American style kitchenette is equipped with cooker, hob, fridge freezer, washing machine, iron, kettle, toaster, satellite TV, DVD, radio. There are 2 bedrooms, 1 bathroom and 1 downstairs WC. The lounge area has 2 sofa beds which can accommodate children very comfortably. We are an Irish family who use this beautifeul villa twice a year, in June and September for extended holidays. The villa is ideal for a family holiday as it is close to all amentities but in a quiet urbanisation. There is a large amount of outdoor space , ideal for small children and families to enjoy the ffine weather but providing shade when neccessary. We always enjoy our time in Cabo Roig and recommend it to all our friends. Centrally located for all amenities, close to many beautiful beaches and lovely seafront walks yet conventient for travelling inland to other areas of Spain.There are also bicycle lanes for safe travelling on bikes. The area caters for many nationalities and is a favourite location for spanish families for their annual holiday. The large patio area at the front and side of the house is ideal for outdoor living in the summer. 1 large family bathroom with bath with shower, toilet, and bidet. 1 downstairs bathroom with toilet and handbasin. Lovely house, everything we required was provided, very convenient to beach, pool, markets, shops and shopping centre. Very quiet locality. I'd just like to say thank you to Marie who made our stay at her villa a very pleasant one. It is situated in an ideal spot. Lovely and quiet but only 10-15 minutes walk to the lively bars and restaurants. During our 10 night stay we visited Spanish, French, Morocan, Indian, Chinese, Irish and English restaurants. Our average bill was 60 euros for four people so not only a good variety but also good value for money. The website was easy to use and we would recommend it to our friends. Esta muy pero muy bien. Tiene todo lo necesario para pasar unas cómodas vacaciones. 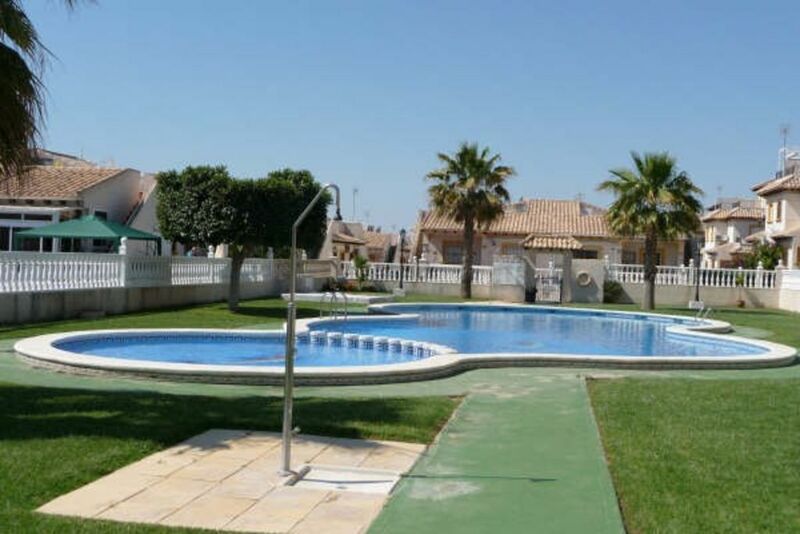 Realmente es una casa muy acojedora.Nosotros estuvioms muy agusto, ademas esta genial comunicada con la playa y las zonas de ocio.La urbanizacion esta muy limbia y se respira mucha tranquilidat tanto por el dia como por la noche.La piscina es estupenda y esta muy cerca de la casa.Los dueños son personas muy agradables y han echo todo lo posible para que nuesta estancia sea inmejorable.El echo de que no hablen español no ha sido ningun impedimento.Gracias,pasamos unos dias estupendos y recomiendo la casa a cuaquier famialia o gupo de amigos. Un saludo y gracias de nuevo por dejarnos disfrutar de vuesta preciosa casa. Golf: Costa Blance is a perfect place for a long or short golfing break. The average winter rainfall in Costa Blanca is less than other regions in Spain, the landscape is spectacular, gleaming blue sea and beautiful beaches, reasons why many golfer are making it their winter destination. There are an array of golf courses with easy reach including Villamartin Golf Course which hosted the Spanish Open and the Alicante Golf Course designed by Seve Ballesteros or the nearby Campoamor Golf Club.